The Tantum ergo sacramentum, which is attributed to Thomas of Aquino, is a song in honour of the Sacrament that is sung in the Catholic Church during the Benediction of the Blessed Sacrament. Diepenbrock set this text to music for male choir and organ on 9 May 1901. This was during the three-month period (from the end of April until the end of July) that he and his wife temporarily resided in the Cornelis Schuytstraat in Amsterdam, before moving into their home in the Johannes Verhulststraat. No direct reason for composing the work has been documented. It might have been the performance of the Stabat mater dolorosa in the original version of 1888 (RC 22) by the male choir St. Gregorius Magnus, conducted by P.J. Jos Vranken in the Dom Church in Utrecht on Good Friday 5 April 1901, that rekindled Diepenbrock’s interest in the genre. In a letter from a later date Diepenbrock intimated that there is a relation between the Tantum ergo and his Mass, as it is a rundown of various themes from it. (BD V:273) Indeed, the themes are similar. And in both works chromaticism that makes great demands on the choir, plays an important role. 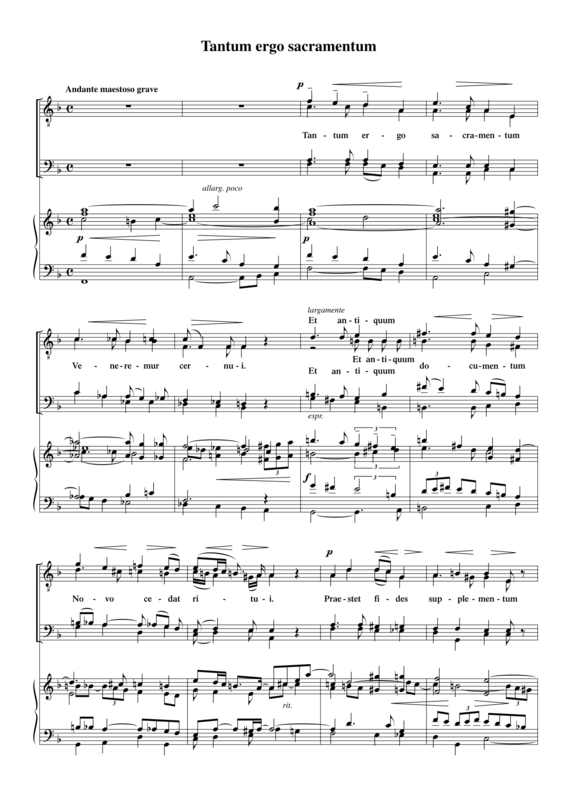 Diepenbrock’s Tantum ergo sacramentum, with the tempo indication “Andante maestoso grave”, has a mystical atmosphere as the vocal sections are mainly sung in gradations from p to mp and subtle harmonic changes take place constantly. The choral setting is homophonic, while independent lines in the organ part suggest polyphony. The two strophes of the Latin poem are through-composed, with a four-measure intermezzo between the two strophes and a two-measure intermezzo preceding the finale, where the words “Compar sit laudatio” are repeated. This repeat is sung in unison by all the voices and is sung forte like the beginning of the second strophe “Genitori genitoque laus et jubilatio”. Thus, the sections calling to praise contrast with the rest of the work. The last line of the text ends on the dominant chord, after which the whole composition is repeated right from the beginning. The coda (two measures by the organ and four measures with “Amen” by the choir and the organ) is in the principal key. The premiere of the Tantum ergo sacramentum took place on 23 October 1904, during a Solemn High Mass in the Moses and Aaron Church in Amsterdam for the 25th anniversary as a singer of Johan J. Rogmans. Alongside this work, the Veni Creator Spiritus by Bernard Zweers, conducted by himself, and the Te Deum by Johannes Verhulst, conducted by Anton Averkamp, were performed. It was ten years before Diepenbrock’s composition was played again, on 25 May 1914. This time it was performed in the Concertgebouw by the Royal Liedertafel Apollo, conducted by Fred. J. Roeske, and the organist Evert Cornelis. Diepenbrock’s Hymnus de Spiritu Sancto (RC 69) was also performed. According to an entry in the diary of Elisabeth Diepenbrock, the members of the choir initially did not like the pieces, but after having studied them for a long time, they love them. (BD VIII:350) The Veni Creator Spiritus was even encored. ‘Apollo’ performed the two choral works again at a concert in the Concertgebouw on 9 May 1916. Despite Diepenbrock’s great appreciation for Roeske’s dedication to his works, a week later he requested the conductor no longer to perform the Tantum ergo sacramentum in a concert hall as it is more suited for the Church . (BD IX:106) Because of this the composition disappeared from the concert stage during Diepenbrock’s lifetime. 23 okt 1904: Eerste uitvoering van het Tantum ergo sacramentum voor mannenkoor en orgel tijdens de plechtige hoogmis in de Mozes en Aäronkerk te Amsterdam ter gelegenheid van het 25-jarig zangersjubileum van Johan Rogmans. Voorts werden uitgevoerd het Veni Creator van Bernard Zweers (onder leiding van de componist) en het Te Deum van Johannes Verhulst, gedirigeerd door Ant. Averkamp. Gisteren werd ter eere van Rogmans in de Mozes en Aäronkerk, waar hij voor 25 jaar zijn intrede als kerkzanger deed, een plechtige hoogmis opgedragen. — Het zangkoor der kerk droeg voor Veni Creator van Bernard Zweers, gedirigeerd door hemzelf, Te Deum van Verhulst, geleid door Averkamp en de mis van den Italiaan Pirri en Tantum ergo van Diepenbrock, gedirigeerd door den dirigent van het zangkoor, Grijseels.